I wanted one of these for my pregnant partner to reach kitchen shelves. However, after trying it I decided against as it was not very stable. Ordered a few. don't forget 4% Quidco at the moment! Ordered 2 - Thanks !! What? There's a lot of short people in my family! Ordered thanks, now just have to figure out what I'll do with them! A great design, voted hot but I'll stick with standing on a chair. I bought this at the original price last weekend...****!! Used it a number of times already though. It seems pretty sturdy. The built in handle is different to some that I've seen and it works well. Should double your money on these. I go to the boot sales in the summer and these will sell like hot cakes. Order more while you can. Why take ridiculous levels of stock and leave none for other people? Nice one..
Why take ridiculous levels of stock and leave none for other people? Nice … Why take ridiculous levels of stock and leave none for other people? Nice one.. It sounds obvious but do not let elderly people get up on these or anything similar! My mum has been going steadily downhill since a big fall off one a couple of years ago! It sounds obvious but do not let elderly people get up on these or … It sounds obvious but do not let elderly people get up on these or anything similar!My mum has been going steadily downhill since a big fall off one a couple of years ago! Elderly folk arn't safe doing most things these days :/. 1/4 hospital beds taken up by folk over 75 i believe. Anyway, great price OP. Voted hot. What? 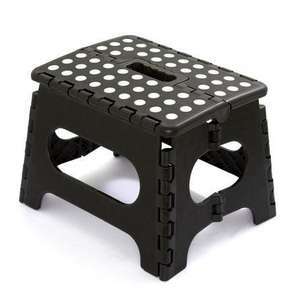 8 short people or 8 of these stools? If 8 stools, is it to stack them? My mother fell off the top of a stepladder onto concrete and grazed her leg. Her friend fell on her bedroom carpet and broke her leg!